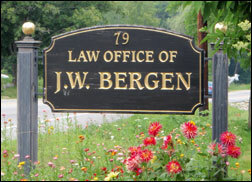 Contact Us - Jens-Peter W. Bergen, Esq. Office Hours are 7:30 a.m. to 6:30 p.m. weekdays; other hours by appointment. Please use the form below if you would like me to contact you. NOTE: Use this area of the form to inquire about other services or for your comments. Any information sent via this form is not secure. Do not provide me with confidential details of any legal matter you may be involved in via this form.